With Predestination, the Spierig Brothers have proven that Australia can do genre just as well, if not better, than anybody, if we didn’t know that already. Too often confined to making films in which the action takes place amidst the red dirt of our outback or the malaise of our suburbs, Predestination is proof positive that a good story, good performances and a mastery of the technical elements can result in an Australian film that is more than a match for anything churned out by the Hollywood machine. Devoid of bombast, this is a science-fiction fable in which special effects are noticeable only by their absence. Yes, there is time travel happening here, but the means by which this occurs is simplistic and no less plausible than any other technique that has gone before it and without the technical gimmickry upon which other films have relied (a DeLorean anybody?). Yes, this is lo-fi sci-fi, but the film is engrossing from its opening moments and never lets up, despite the fact that, on the surface, very little happens. It is a film that is set both in the past and the future – not our future mind you, just the futures of the characters – and does require your undivided attention in an effort to understand what exactly is transpiring, but it is well worth such a commitment. This is the third feature for identical twins Michael and Peter Spierig, following Undead and Daybreakers, but this is without doubt their best yet. 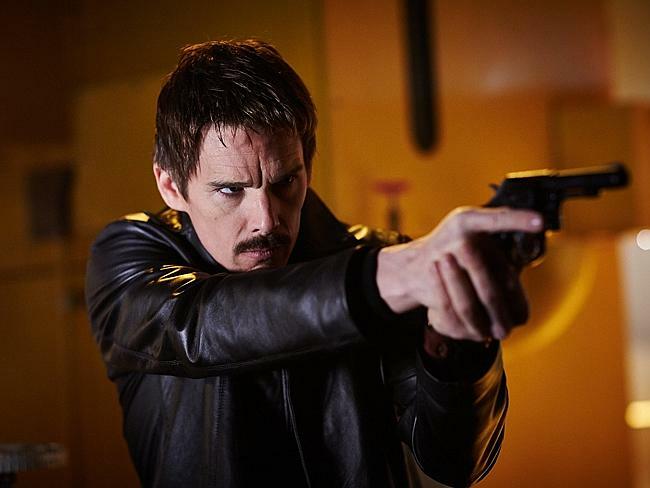 Ethan Hawke reteams with the brothers (after they worked together on Daybreakers) to play an unnamed ‘temporal agent’; one of a small group who jump around through time in order to prevent major crimes. His current and supposedly final mission is to track down a terrorist labelled the Fizzle Bomber before he detonates a bomb in downtown New York. Hawke’s character is working in a bar in 1970 when he meets a strange man who promises a story that will knock his socks off. From this point, a good portion of the film focusses on visualising the story being told by the mysterious customer as he details a life experience far removed from anything that our time-travelling bartender could have expected, or so you would think. 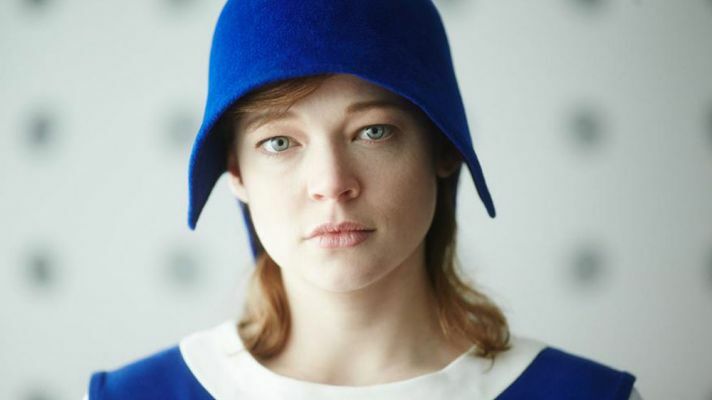 It is an intriguing and engaging tale of abandonment, survival and transformation that is rendered all the more moving by an exceptional performance by Sarah Snook. After being lumbered with a ludicrous character in These Final Hours, Snook redeems herself here, delivering a nuanced and moving performance as a character that undergoes the most extreme of transformations. This is a difficult film to explain in that it does become confusing in its exploration and manipulation of ideas about identity. The basic premise is nothing new as movies about people travelling back in time to change future events are a dime a dozen – Men in Black 3, Looper and Edge of Tomorrow are three recent examples that instantly spring to mind – although the story on which Predestination is based was written by Robert Heinlein way back in 1958. The Ouroboros – an ancient Greek symbol depicting a snake or serpent eating its own tail – is a recurring theme in the film and, as the story unfolds, the connection becomes clear; well as clear as it can be in a film that will probably take multiple viewings in an effort to ascertain whether all the pieces do fit neatly into place. The film is very much a two-hander with Hawke and Snook taking on multiple characters or, at the very least, multiple incarnations of the same character depending on your interpretation of events. 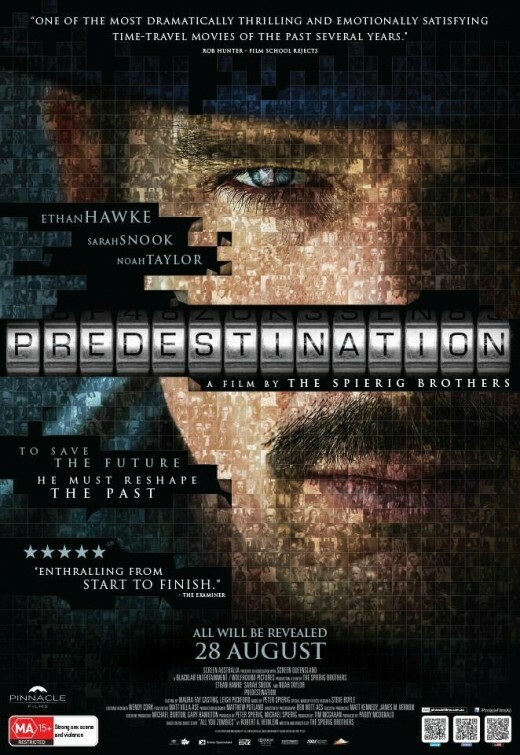 Whilst Predestination is being sold with Hawke front and centre of the marketing material, which is perhaps understandable given his profile, it is the casting of Snook that has proved the masterstroke from the Spierigs. Whilst Noah Taylor also features as Mr Robertson, the head of a mysterious recruitment agency, and Freya Stafford makes a late appearance, there is nothing that identifies this as an Australian production (other than the Screen Australia logo that precedes the film), so hopefully it will avoid the cultural cringe that seems to afflict so much homegrown product (no matter how good it is) and secure a considerable audience here as well as find success in international markets. After all, this is a film that looks and sounds great – the lighting is atmospheric, the sets, costumes and make-up are excellent and the score is pitch perfect – and is well worth seeing.